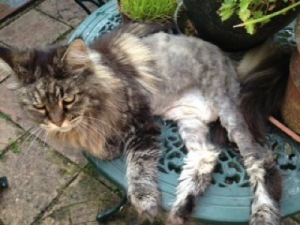 I am so grateful to you for sorting out Tiggy for me. would be a huge challenge.- I would not have blamed you if you had refused.You were so brilliant with giving us all your patience, gentle care and consideration. Hair by hair was given your full attention. I really value how much time you gave us and could see the concentration on your face how exhausting it was. I am disappointed that the vet had never mentioned how long her claws were, especially as they had attempted to groom her,and they should have recommended having them clipped. She seemed totally un-phased last night and had a good appetite and washed well and slept by my feet as usual.